The Idea Behind This Theme We wanted to build something awesome that helps churches, staff members, and the people they serve. Something that would enhance the church experience for users, increase engagement and retention, decrease confusion, and that focused on the details of how this could work for that majority of church communities out there. So, with that in mind, we build Passage. Staff members can add/update their own profiles, sermons and/or pages – and provide those that they serve with up to date information like upcoming group meetings, recent studies, notes, or anything else. Visitors can get group information, purchase reading materials, and check to see if they missed anything from their last meeting. Finally, admins can oversee the flow of information, and have the ability to add, edit, assign, and delete information and users. The New Staff Role & Extended User Profiles Passage comes fully integrated with a new “Staff” user role specifically built for religious institutions. This Staff role provides staff members with the ability to add, edit, and update their own information. This role is similar to the “Author” role native to WordPress, with a few added tools and abilities to provide your staff members with the right amount of credentials. This role also allows users assigned to this role to edit their own personal information (ie. bio, photo, contact info, etc.). Custom User Login Because your staff should feel proud to login to your site! Customize the login for your users to match your site with easy to use options. Go ahead, check it out. Choose or upload your login logo, position the login form location, add a background image, set a color fallback, and add custom html! Sermons Adding a new sermon is easy! Just navigate to Sermons > Add New to add a new sermon. Each sermon has four distinct option sections: 01 – The Media Section: is used to distinguish the sermon from others by providing options for source material. For example: video media, audio media, download media – and some extended options like a poster image for each. 02 – The Content/Text Section: (Visual Composer) allows for staff to provide more dynamic content such as sermon notes, study guides, additional reading, etc. 03 – The Sermon Categories Section: is where categories can be managed for this sermon. See Sermon Catalog section for more details on how this is used. 04 – The Sermon Player Section: is where you can assign a specific player to your sermon. The Sermon Player assigned will then be used for how the sermon media looks and acts. See Sermon Player Section for more details. Sermon Players Adding a new sermon player is easy! Just navigate to Sermon Players > Add New to add a new sermon player. Each sermon player has two distinct option sections: 01 – The Build Section: is used to build the main structure & function of player, from toggling elements on & off to building a dynamic playlist. Players can be used as static players or as dynamic players. 02 – The Styles Section: is used to manage the styles of the player, from background colors & images to font sizes, families, and colors. It even offers the ability to call bg images from the sermon dynamically. Each player can be assigned to a sermon (or sermons) to dictate how they are displayed and function. This is where the power of this starts to show – and saves users a ton of time from needing building the same sermon styles over and over. Sermon Cataloging This is where the power of the Sermons Player plugin really comes to life and creating a catalog is really simple. 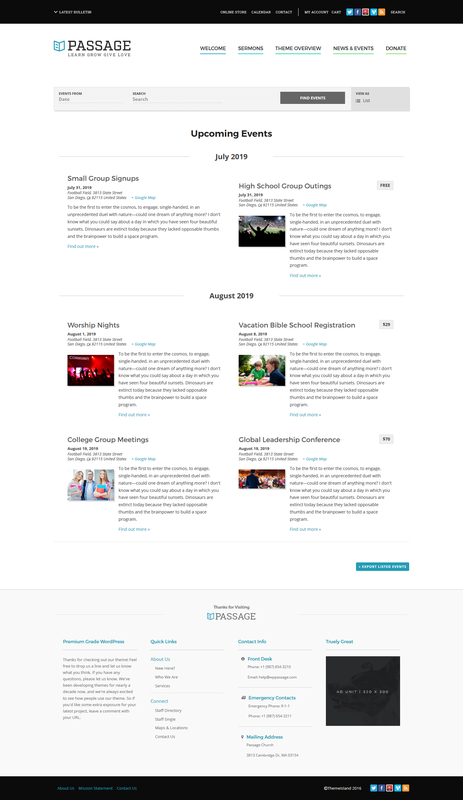 Just navigate to any page (or create a new one) and assign the Sermon Catalog page template. A new drop-down list of options will be provided for you including, filtering sermons by Sermon Category and selecting a number of sermons per page. The theme will do the rest. 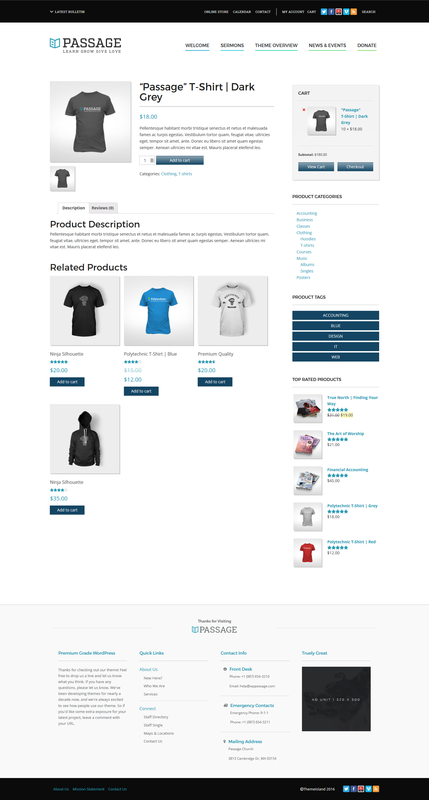 This catalog will be provided after any relevant content included in the Page Editor (Frontend or Backend). Sermon Categories have been separated from “standard” categories used for posts to keep things neat and organized, so there won’t be any confusion. For example, you could use a Sermon Category titled “Youth Department” for all youth related sermons > Then use this Sermon Category to isolate and display only sermons from this Sermon Category. Donations You’ll have the most robust WordPress system available for accepting donations. On top of that, we’ve extended Give to work even better with this theme. We’re maintaining all of their base functionality – and including some cool extensions that we use in our own projects. We’re also including a custom Visual Composer module to make this even easier. Just add the Give Item module and select one of your give forms from the dropdown. Then, if you want, you can use the extra included options to customize this module further. Events You’ll have the ability to create and manage your calendar of events with ease. Get professional-level quality and features with this integration – and The Events Calendar will help take your site to the next level. On top of that, we’ve extended The Events Calendar to work even better with this theme. We’re maintaining all of their base functionality – and including updated styles and outputs. Online Store Yep. WooCommerce is enabled on this theme, which means you can use it to sell anything, beautifully – like shirts, gift cards, or anything else you can dream up. WooCommerce does a TON of amazing stuff out of the box and we’ve setup the integration so that this theme will work seamlessly with it. We’ve also gone through and made sure all of the styles match to the theme styles/options. Blog Template Blogging is at the very heart of WordPress and we haven’t forgotten. 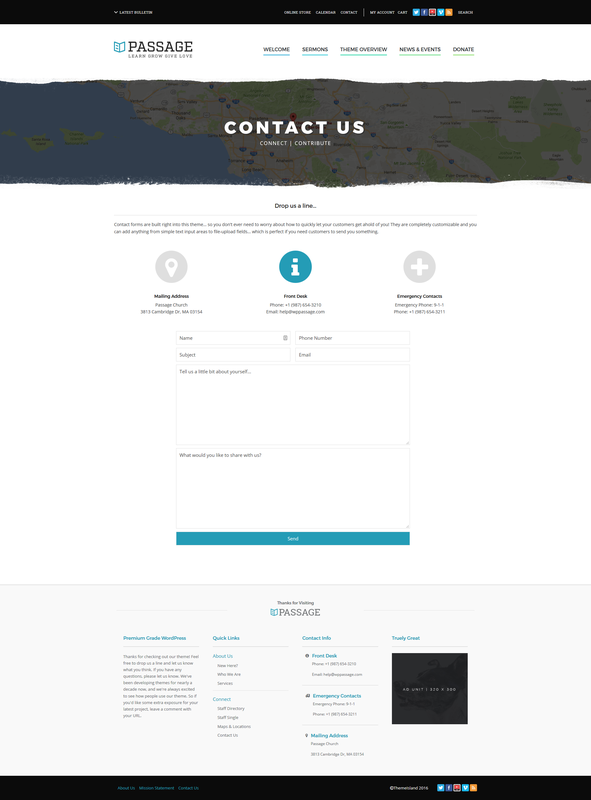 This theme includes our custom Blog Page Template, which has been used by over 20k+ users across 15+ themes. It utilizes the power of WordPress and focuses on clean, consistent, professional design. Categories assigned are used to filter posts that are displayed – and because this is a page template, you can have as many blog pages that you want. This is really helpful when you want to offer a filtered blog for a specific group of people (ie. Families, Senior Citizens, etc.). Post Grid Template We are proud to be including our custom Post Grid Page Template, which has been used by over 20k+ users across 15+ themes. It utilizes the power of Isotope to “filter & sort magical layouts” and focuses on clean, usable interactions. Categories assigned are used to filter, sort, and animate posts visibility. We’ve even including updated styles, an updated hover animation, and new lightbox integration for this. Layouts We’re including several layout options including: default, sidebar left, sidebar right, dual sidebars right, dual sidebars left, dual sidebars left/right, and full width (no sidebars). With Visual Composer, you have even more control by stretching the row, stretching the row and content, and assigning specific columns widths to rows (ie. 1/4 + 1/4 +1/2). You can also add a row inside of a row to make this more flexible. Adding Content We specifically built Passage with this in mind. 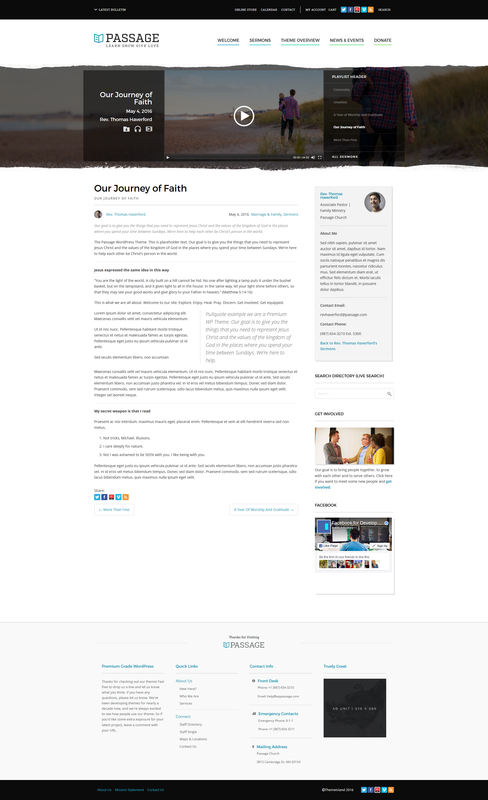 Staff can add and edit any information that they find relevant for their own sermons/pages/posts. So a High School Pastor can add the required reading for the week, a Junior High Pastor can add a study guide for an upcoming meeting, and a Small Group Leader can update the group notes if something unexpected happened during the week. The idea here is to give your staff an easy way to communicate with their groups, online. To make this even easier, we’ve included a premium drag and drop page builder with front end editing abilities! Built on the Mythology Engine Mythology Engine has been developed with the sole purpose of creating an efficient method of publishing themes with a streamlined development process… Key features include white-label options panels, “in-dashboard” documentation, and a no-nonsense approach to content management & theme options. Visual Composer Build beautiful pages and create your own custom layouts using over 30 different content modules ranging from image-sliders to text blocks to videos and maps. Visual Composer is the most popular visual editor available to WordPress and it’s bundled in the theme. Updates are be included for free with each theme-version update. 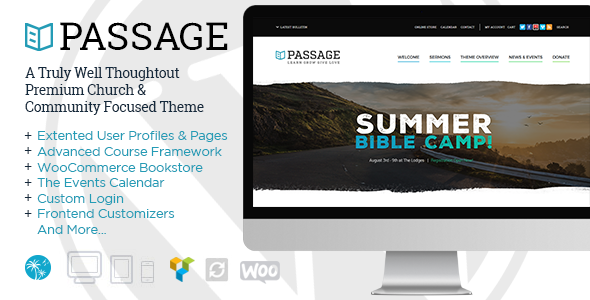 Visual Composer – Extensions (Passage Exclusive) We’ve added some visual modules to make life easier for you, including Donations, Latest Sermon, Sermons by Category, Hover Image, and a Standard Item (with image, link, and title capabilities). Each of these offers customization options right in the module panel. Revolution Slider Slider Revolution is powering over 1,000,000 WordPress sites! It’s not just a slider, but a new way to deliver ideas. It’s an innovative, responsive WordPress Slider Plugin that displays your content the beautiful way. Slider Revolution has made building professional sliders easier. Whether it’s a Slider, Carousel, Hero Scene or even a whole Front Page, the visual, drag & drop editor will let you tell your own stories in no time! Mega Menu You can create widgetized mega menus using the built in visual mega menu builder. This integration includes features like drag & drop Mega Menu builder, the ability to display WordPress widgets, support for traditional “flyout” menus along with Mega Menu sub-menus, opening menus with hover intent and click events, fade and slide transitions, along with adding icons to menu items and many more. Theme Options Panel We get it, you want to customize the theme. With this theme options panel, you can. This theme options panel is organized in to sections – and even sub-tabs when needed. You don’t actually need to change anything here, but in the event that you want to modify something – the options are there. Theme Skinning With Live Preview Eliminate the guesswork from customizing the theme. Built on the WP Theme Customizer API with some special tricks blended in, you can change just about every typographic or color across the entire theme… there’s no need to reload the page on the front-end though – the Theme Customizer will show you an instant preview of what your changes look like right there on the same screen. HTML5 Fueled SEO We re-wrote our entire theme-base from scratch to include the latest, most relevant HTML elements and tags to allow for the best possible search engine results. Multi-Language Support The entire theme has been fully internationalized and prepped for your language translation. Just follow the usual translation process and the theme will do the rest. Custom CSS Got something custom that you want to drop in? Simple. Just drop them into our theme control panel and the theme will do the rest of the work for you. Built with Ordinary People in Mind Our goal is to deliver a theme that anyone can use & customize, without any need for 24/7 customer support or long-winded documentation manuals. We recommend uploading the theme demo if you want a head start, but the theme has truly been designed to be answer any of your questions as you use it, so don’t fret if you don’t know how to code. Helpful Support If you still need some help or have a question, feel free to ask us at our dedicated support forum. Just make sure to include your endgoal to help us understand how we can help. Built with Developers in Mind, too! Our code is clean, organized, and well commented. Everything has it’s rightful place in this theme, and making advanced customizations to templates, stylesheets, and functions has never been easier. Fully Responsive We were one of the first theme crews to dabble in ‘responsive design’ way back in the day, so we know a thing or two about how to do this properly. Fluid grids are used at larger breakpoints, and fixed widths are used on smaller devices to ensure ideal spacing. The type size shifts on smaller devices to be larger and easier to read, and images and other media are sandboxed to prevent anything from breaking the layout. - UPDATED: Styles for The Events Caneldar (theme-4-plugins.css 199, 349) - This fixes MediaBoard widget for audio only, Mediaboard playlist styles, and All Events styles. - UPDATED: theme-4-plugins.css styles for The Events Calendar update.